It's no secret that Muscle Car performance was on the decline after 1970 or so, but Pontiac engineers pressed on when they created the Super Duty Trans Am package, which was still a screamer in 1974. The SD-455 was a remarkable engine, a legit race-bred machine among the plummeting compression ratios and horsepower levels of other V8s of the day. This is a great example of a low-mile and correct 1974 SD-455 Trans Am from the Brothers Collection. This is the Trans-Am that started it all… the first-generation 1969 Pontiac Firebird Trans-Am, complete with it's understated styling, high-performance suspension, and the highly sought-after 345 HP Ram Air IV V8 / Muncie 4-speed driveline. It's a rare bird for sure, and we're honored to be able to share this prized Muscle Car from the Brothers Collection. This week, we check out a full-house 1970 Pontiac GTO Judge Convertible that sports the 370 HP Ram Air IV 400 V8 and a 4-speed Muncie transmission. It's a fantastic example of a car that was ordered with all the "goodies", and it is believed to be one of 6 ever made. The Brothers Collection is home to some spectacular Pontiacs, this one is near the top of the list! This week, we dive into drag racing history once again with a 1962 Pontiac Catalina Super Duty, featuring the race-bred 421 V8 and the aluminum front body panels. This car was successfully campaigned by the Packer Pontiac team driven by Howard Maseles. In it's day, this car ran the quarter in 11.73 at 118 MPH, good enough for a national NHRA Super Stock record. Today, it is one of the many historical Muscle Cars in the Brothers Collection. 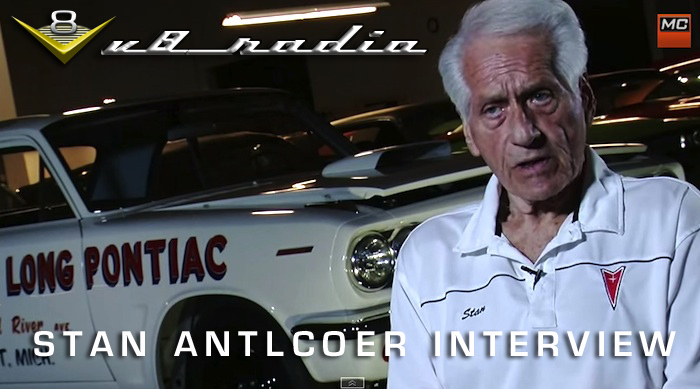 In this episode, we share the entire interview with Stan Antlocer, former driver and owner of the "World's Fastest Pontiac Tempest". We featured Stan and the Tempest in a Muscle Car Of The Week video, but this V8 Radio podcast contains all the stories from the full interview. To say Stan has been around the block a few times is an understatement... we're fortunate he shared some of his stories with us. Click the pic or THIS LINK to listen to this extended interview on V8 Radio! This week, we have a special episode of Muscle Car Of The Week featuring an exclusive interview with Stan Antlocer, former owner / driver of the 1963 Stan Long Pontiac Super Duty Tempest. This car was known in Super Stock A/FX racing as the "World's Fastest Tempest" and was a record holder. It is one of the 6 lightweight factory built cars made. Today, the car is completely restored, and we reunited Antlocer with the 421-powered monster after he last saw it back in 1964. It is one of the many vintage race cars in the Brothers Collection. Rare and unusual Muscle Cars are highly prized in the Brothers Collection, and this week, we feature one that is both! This 1969 Pontiac Firebird convertible features a very unusual, special order color scheme, but the best part is the Ram Air IV 400 V8 under the hood and the automatic transmission driveline. Pontiac only made five in this configuration! This car has over 30 options making it a highly prized vehicle even if it did not have the Ram Air Engine. Shot at the 2014 Muscle Car and Corvette Nationals in Rosemont, Il.